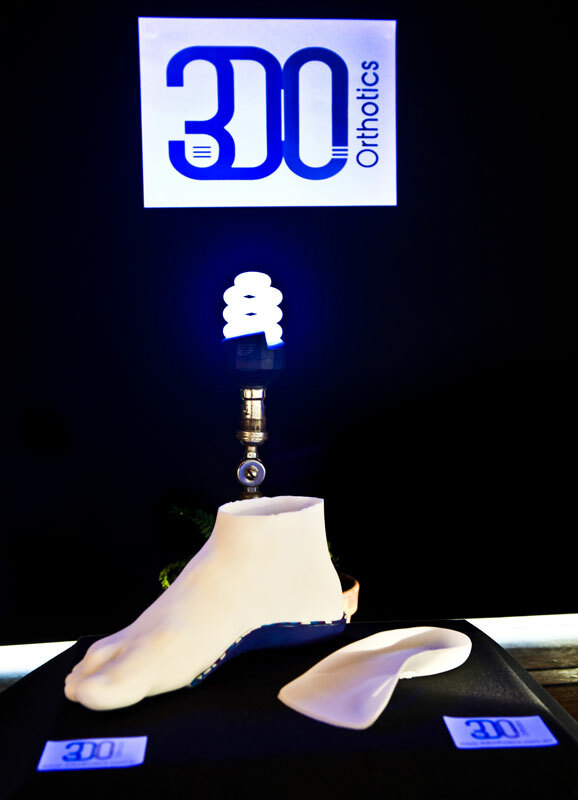 3D Orthotics | 3D Orthotics launch night a great success. 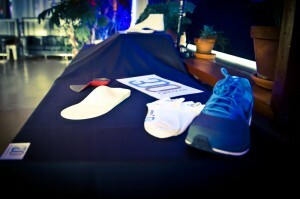 Home - Blog - 3D Orthotics launch night a great success. At the Light Space in Fortitude Valley last Thursday night, three young Australian professionals hosted the world launch of a product set to revolutionize the custom orthotics industry. In what is considered to be a world first, 3D Orthotics combine high accuracy digital foot scanning technology with the most advanced 3D printing technology and specialist podiatrist calibration to produce the most accurate orthotics available in the world today. Attendees enjoying the presentation about the journey of 3D Orthotics. Described as the three amigos by launch convener Seth Lawrence, Brisbane podiatrist Justin Hogg, robotics engineer Wes McCombe and software engineer Russell Considine, explained that their combined talents provided the necessary technological breakthroughs to bring 3D Orthotics to the market. Amigos they may well be – the friendly chemistry between them was clear as the audience, which included health professionals, scientists, engineers, 3D printing specialists from the U.S.A. and sports people, including elite athletes Mitch Kealey and Alana Boyd, were taken through the fitting and production process. 3D Orthotics on display and just one of the many interactive exhibits of the night. Heads nodded in agreement as Hogg spoke of the small blemishes in today’s orthotics which inevitably occur as a result of plaster moulding techniques which can lead to significant frustration for the wearer. He likened the experience to the irritation we feel when a grain of sand finds its way into our sock. Hogg also detailed the unique differences 3D printing offers compared to milling, multiple intrinsic densities, complex structures and ever evolving material choices. Hogg then explained that this is overcome through the 3D orthotics high accuracy digital foot scanning technology and engineering software which models a computerized prescription for a 100% accurate orthotic. The 3DO process is demonstrated in this animation. The launch promoted the use of 3D printing as a new frontier for high tech manufacturing. It included a small scale demonstration of the latest 3D scanning equipment, a 3D printing demonstration provided by Nick Gates of Sheldon College and a 3DO printed orthotic demonstrated against a 3D printed foot. 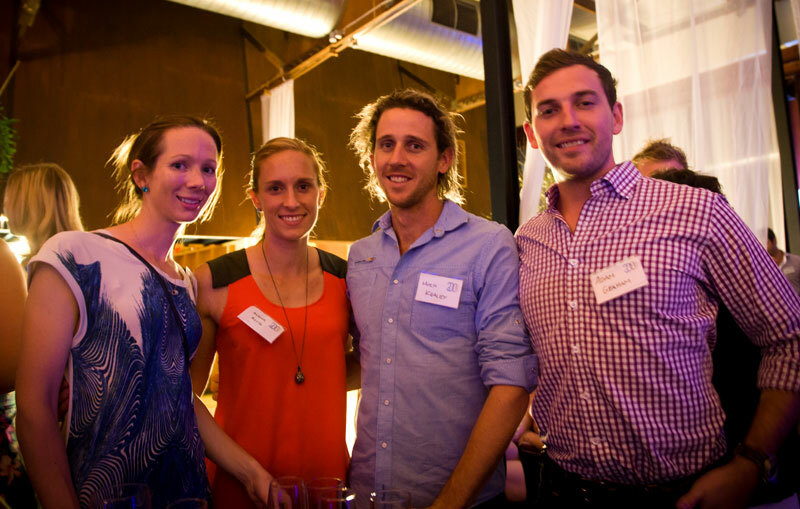 Corinne Myles, Alana Boyd (Olympic pole vaulter), Mitch Kealey (Olympic middle distance runner), Adam Graham. The audience was told that despite clear product superiority, 3D Orthotics will be available at comparable prices to orthotics currently on the market. 3D Orthotics are now available for the first time in the world at any of 5 locations throughout Brisbane. Appointments can be by telephone on (+61) 1300 039 199, contact@3dorthotics.com.au or through online booking here. 3D Orthotics on display with a 3D printed foot!